B.C. 's legislative assembly clerk and sergeant-at-arms were placed on administrative leave over allegations including "flagrant overspending on luxurious trips overseas with questionable business rationale," according to a lengthy report released by Speaker Darryl Plecas. 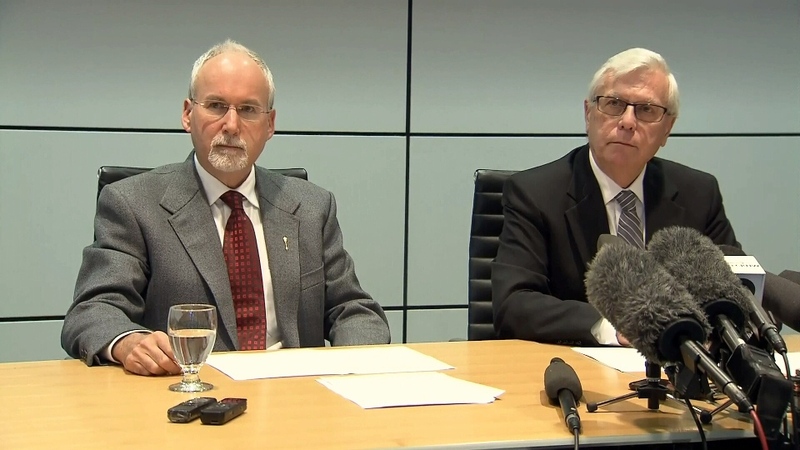 The document, which was made public Monday, also cites "expensing of all manner of personal purchases to the Legislative Assembly, totalling tens of thousands of dollars over a period of less than two years" for Craig James and Gary Lenz's suspensions. Scroll down or click here to read the full report. Plecas's report also accuses the suspended officials of "inappropriate payouts of cash in lieu of vacation, which appear to total in the hundreds of thousands of dollars" and "using working time to make day or overnight trips away from the Legislative Assembly, at the Legislative Assembly’s expense, for what appear to be other than legitimate work purposes." While none of the Speaker's allegations have bee proven, the report offers specific examples of costs that he said appeared "unusual" or "personal in nature." These include more than $5,000 in digital subscriptions allegedly purchased by James and thousands more in expensive tech such as camera equipment, headphones and various Apple products. The report also includes allegations of luxury purchases during international travel including items such as a $1,100 suit and souvenirs. Lenz claimed a full per diem on a day he was attending classes at Simon Fraser University although the sergeant-at-arms did not appear to be on a work-related trip, the audit alleges. In one of the most bizarre examples, the Speaker's report claims he received information that more than $13,000 in wood-splitting tools and a trailer "were delivered directly to Mr. James’s personal residence where they have allegedly been used by Mr. James and Mr. Lenz for their own purposes. "From the Speaker’s inquiries, he understands the justification for the Legislative Assembly purchasing the wood-splitter was that if a crisis situation befell the Legislative Assembly and if in the course of that crisis a tree fell on the Legislature grounds, there could be a need to split the tree up for firewood for use at the Legislature," the report read. "The Speaker has difficulty accepting that rationale, as the scenario seems very remote, and in any event – even assuming external Emergency Services were not able to attend and handle this scenario – a chainsaw and axe would appear to suffice." The Speaker also claims he also received reports about a large amount of liquor apparently left over from a conference being loaded into James's truck. "The Speaker has asked for receipts relating to the purchase of conference alcohol in the 2012-2013 time period and has received expense claims that show purchases of $8,789.84 were made from BC Liquor Stores or Distribution Branches, but whether those are connected to the reports of the alcohol allegedly taken by Mr. James is unknown," the report read. In statement issued Monday evening, Lenz and James denied any wrongdoing while slamming those involved for not sharing the allegations with them before the report was made public. "We are only now able to read the allegations for the first time and we are confident that time will show that they are completely false and untrue," they said. "To be publicly accused of these things after months of secret investigation without being given any chance to respond is contrary to all principles of fairness and decent treatment. It is contrary to how our public institutions should treat people. It is contrary to how the Speaker of the Legislature should act." The suspended officials also reiterated their confidence that an investigation will ultimately clear their names. "We are surprised that the Legislature Management Committee would have gone along with this," the statement read. "To allow the release of unsubstantiated and hearsay allegations is simply wrong. We don’t understand why the members of that committee would not have required that we be given an opportunity to comment before these harmful allegations were published." James and Lenz have been working with lawyers from Fasken Martineau DuMoulin since their suspensions. The two officials were suddenly placed on administrative leave on Nov. 20 amid a criminal investigation by the RCMP that until Monday remained shrouded in secrecy. In the report, Plecas said he felt obligated to bring his observations to Mounties because there was a "real possibility" that a crime may have been committed. "These matters are not simply bare allegations," he wrote. "They are based on my personal observations, interviews with others, and where I have been able to corroborate them with reference to documents and records I could access at the Legislative Assembly within the time constraints that I have been working under, I have done so." Special Advisor to the Speaker Alan Mullen said "what's contained in this report is improper, at times against policy... Obviously, the police and special prosecutors can speak to items which would be, in their opinion, of criminal nature. "For the last two months, the Speaker and I have been called into question," Mullen told reporters. "Our motive is simply this: to look after and protect the British Columbian taxpayer. B.C. deserves better than this." The Speaker's bombshell report also includes allegations "relating to management of employees, including potentially retributive or otherwise unjustified terminations," and "taking steps to conceal information which could indicate improperly claimed expenditures." Plecas brought the report before an all-party committee Monday, which voted unanimously in favour of making it public. "As Speaker, I have duties in the House and I also have responsibilities for the overall administration and functioning of the Legislative Assembly," Plecas wrote in the report. "Broadly speaking, the matters which gave me concern related both to certain specific conduct of the Clerk and the Sergeant-at-Arms, as well as the functioning and culture of the Legislative Assembly as a workplace more generally." The committee also voted to launch a workplace review that will be submitted to an auditor outside the province as well as conduct an audit of the legislature's financial issues. While she was happy to see that some details that led to the dramatic shakeup have been made public, Liberal house leader Mary Polak raised concerns about the way the legislature's finances are being handled. "The report makes clear, I believe, it says that in all instances, these expenses were signed off, in many cases by the Speaker, which raises the question to me: Why are we only finding out about this now in this report?" she said. Green Leader Andrew Weaver issued a statement soon after the report was made public, saying the allegations it contains have "significant implications for public trust in our democratic institutions." "The B.C. Green caucus fully supports the motions passed unanimously today by the LAMC," he wrote. “As a caucus we have made democratic integrity a major focus, championing issues such as lobbying reform and campaign finance reform. The people of our province deserve public institutions they can trust." Solicitor General Mike Farnworth echoed those remarks, saying he was "shocked and saddened" by the alleged revelations in Plecas's report. "I think a lot of what I saw was just unacceptable," he told reporters. "I think the general public would look at it and go 'That's just wrong. That's just not what we expect.'" Political consultant Mike Geoghegan said if true, the allegations in Plecas's point to a "huge lack of control" in the legislature. Geoghegan commended Plecas for his attempt to shed light on the alleged misconduct. "In the darkness, people can get greedy," he said. "It's all allegations at this point, but it's deeply, deeply troubling." In the days that followed their suspension, the unprecedented shakeup at the legislature took a number of twists and turns, starting with Mullen confirming the allegations against James and Lenz dated back until at least January 2018. According to the B.C. 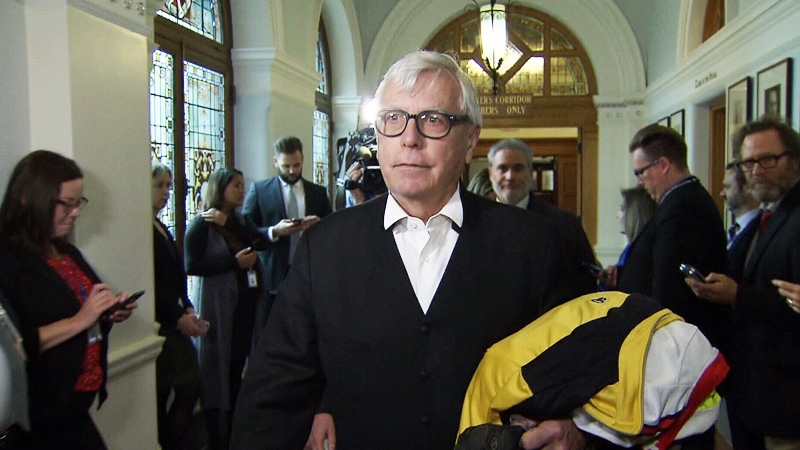 Prosecution Service, two special prosecutors were appointed to the case following a request from the RCMP on Sept. 28. Days later, David Butcher and Brock Martland were appointed to provide police with legal advice during the investigation. 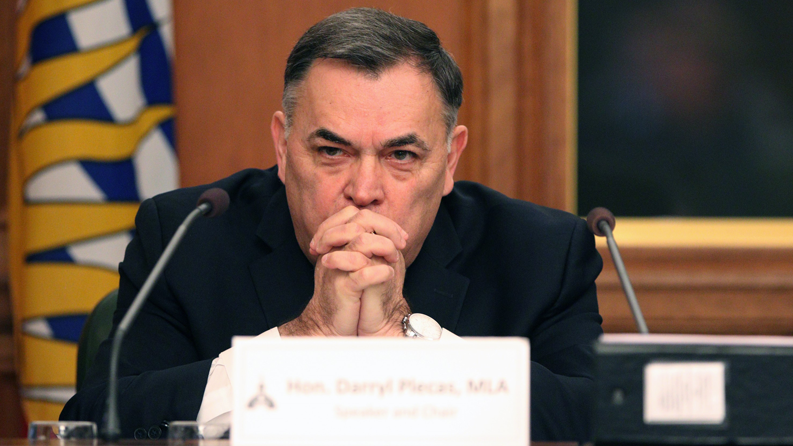 Plecas himself came under fire from his former party, the BC Liberals, who claimed the Speaker recently suggested Mullen himself serve as interim sergeant-at-arms. In early December, Plecas promised to resign if the financial audit he recommended doesn't prompt public outrage and back his handling of the controversy. James and Lenz have repeatedly called for their reinstatement while the investigation unfolds—once in a letter sent by their lawyers to house leaders and again during a Nov. 26 press conference. The full report follows. Viewing this on our mobile beta site? Tap here for a compatible version. 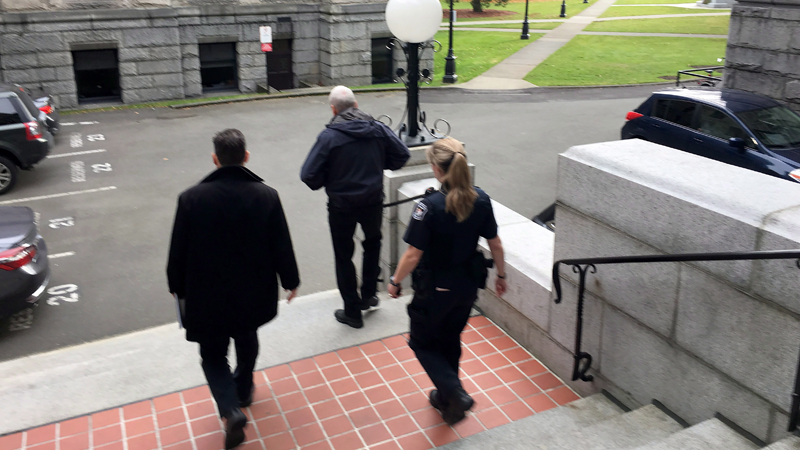 Clerk of the Legislative Assembly Craig James is escorted out of the B.C. Legislature on Tuesday, Nov. 20, 2018.